Camel Up is a betting game for 2-8 players by Z-Man Games and was the prestigious winner of the 2014 Spiel des Jahres award. Games typically last 20-40 minutes. 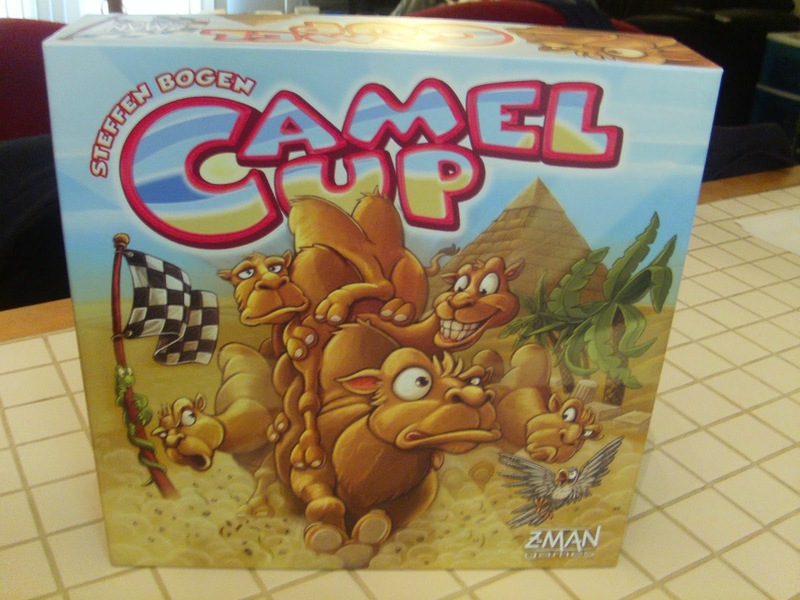 In Camel Up, each player will assume the role of a member of Egyptian high society and are given three Egyptian pounds and a hand of five cards (one for each camel participating in the race). At the end of the game, whoever has the most money wins- simple, right? You only get one card per camel- make it count. On their turn, a player may take one of four actions. They may A) move a camel- they take a period tile (which is worth one pound at the end of a leg- a leg is over when all five camels have moved) and they use the pyramid to dispense one of five dice (one for each camel) and the camel that matches the color of the die moves that many spaces on the racetrack (1-3). They may B) place their desert/oasis tile on the track (when a camel end its move on a desert tile, they move backwards a space and if they end their move on an oasis tile, they move forwards a space- either way, the owner of the tile earns themselves one pound). They may C) place a bet on which camel will be in the lead when the legis finished by taking that camel’s betting tile (there are only three payouts for each color of camel, though- 5, 3, and 2 pounds- the earlier you place a correct bet, the more money you’ll make.) Or, they may D) take one of the cards from their hand and put it face down in one of two piles- one pile is for bets on which camel will win the race, the other is for bets on which camel will be in last place when the race ends. On your turn, you take one of those four actions, then play proceeds to the left. Once all the camels have been moved, the leg is over and each player receives money for their pyramid tokens and payouts (or penalties) for their bets placed on the leader of the leg. Once a camel crosses the finish line, the race is over and the two piles of cards are rifled through- incorrect bets are penalized and correct bets earn payouts (again, with earlier bets being worth more). The player with the most money wins- simple as that. Well, not quite. You see, the thing that makes these camels particularly tricky is that they stack. Any camel that ends its move on a space with another camel climbs on top of it. Furthermore, the camel on top of a pile of camels is considered ahead of the ones below him. What’s more, if a camel on the bottom of a stack moves, he takes all the camels on top of him with him. What results is a game of probability. For instance: You know that the yellow, white and blue camels have moved this leg- which just leaves orange and green. Given the position of the camels on the board (and the fact that a camel on its own can move 1-3 spaces) how likely is it that orange will make it into the lead? What about green? On which should you bet? Given, there isn’t a whole lot of player interaction. Sure, a player can place their desert/oasis tile, which may directly alter the course of events in a given leg- but it certainly isn’t foolproof. No, most of your time in Camel Up will be spent looking at the board and pondering how to squeeze a couple more pounds out of this leg than your opponents. But I don’t want to mislead you- Camel up is not boring. Far from it, there were times playing this game where I was agonizing over a choice as if there was real money at stake. I feel that this is the mark of a successful betting game- one that gives you excitement, tension, high stakes and just the right amount of luck. Camel Up provides all of these things. What’s more, the components are really lovely pieces of the whole Camel Up experience. The camels are wooden and stack nicely. The pyramid is a great way to dispense a single, random die. The tiles for betting on the leg leader (and the pyramid tiles) are nice and thick and really make a satisfying clacking sound when you pick one up from the center of the table and drop it in front of you like the calm, cool and confident high stakes gambler you are. However, while I certainly enjoy Camel Up and I think that it is a solidly designed game with no glaring flaws in theme or mechanics (and also, incidentally enough, a great way to teach chance and probability to younger players) it strangely isn’t one of my “must-play” games. I enjoy it and have a great time playing it, but I’m just not itching to play it again immediately after finishing a game. This is a great game for beginning gamers and an excellent way to kick off a game night. I highly recommend that you check it out, though, dear readers- maybe it will strike a bolder stride with you. Want to stack some camels in pursuit of fame and riches? If you live in the Bloomington area, you can find this game at The Game Preserve. If not, check it out at your local game store. Support local game stores!